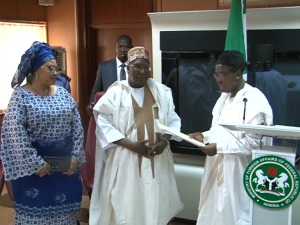 The Immediate past National Chairman of the Nigeria’s ruling political party, The Peoples Democratic Party, PDP, Alhaji Bamanga Tukur has been presented a letter of credence as an Ambassador At Large. An Ambassador- at Large is a diplomat of the highest rank or a Minister who is accredited to represent his or her Country Internationally. The Appointment of Bamanga Tukur is historic and defining moment for Nigeria. Says the Minister of Foreign Affairs Ambassador Aminu Wali who presented the letter to Ambassador, Bamanga Tukur.